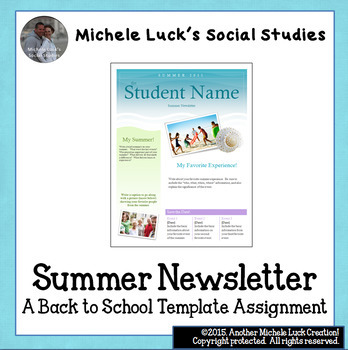 This is a one page template for students to create their own summer newsletters for a back to school activity. 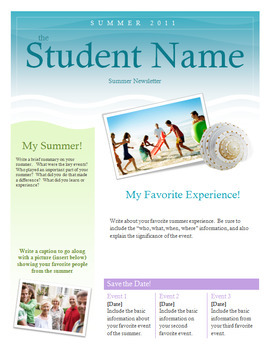 Includes sections for students to list their three favorite events of the summer, a full description of their favorite summer event, and captions for images of the most important people of their summer. Great for a starter or introductory activity. Could be used as a handout to guide students in creating a hand-written version with drawn or pasted images, or may be used as digital template for students to use with digital images. Great to post on the bulletin board or in the halls for the first weeks of school! This could also be used as an opening day activity for staff to introduce the use of technology and as a "get to know you" activity.